Book a Free Initial Family Law Consultation by entering your case details and then connect with one of our lawyers. Our clients and colleagues share stories and experiences they have had with Radley Family Law. Meet our experienced team of family law lawyers who will obtain the best possible outcome available under the law. Radley Family Law is a leading Ontario family law firm with expertise in a wide variety of family disputes and legal issues, including divorce, spousal support, and child custody, access, and protection. The firm is led by Rachel Radley, a noted Vaughan family lawyer and former attorney at Ontario’s Family Responsibility Office (FRO). Through her years of experience, Rachel has developed a reputation for developing fair, reasonable, and enforceable settlement agreements. Based in Vaughan, our team of experienced family lawyers has provided service to hundreds of clients across Ontario, including in Toronto, Richmond Hill, Maple, Newmarket, Woodbridge, Concord, Brampton, Markham, and York Region. Each family lawyer at our firm aims to treat their clients with dignity and professionalism during this difficult period in their lives, and to help them emerge from the legal process with a new lease on life. At Radley Family Law, we understand that no two relationships are alike, and that each of our clients will face unique challenges. It is our job to help you assess your legal options and ensure you fully comprehend your best path forward. Over the course of an average life, there are few experiences more devastating than divorce. Outside of the loss of a close family member, divorce is often among the most stressful and emotionally exhausting events a person can endure. Each Radley family lawyer endeavors to understand this, and to provide compassionate, caring service to the people who need it. We have helped hundreds of families like yours navigate the complex requirements of Ontario’s family court system. Real-life family law doesn’t look like it does on TV. The Canadian family court system is not designed to punish spouses for bad behaviour. Rather, it is concerned with the best interests of the child, support, and the fair and equal division -assets. The court system, with the help of a family lawyer, aims to establish a resolution that gives both parties a fair chance at a better life. The services of a qualified family lawyer are particularly crucial when children are involved. Our team treats children’s wellbeing as an essential priority, and will work tirelessly to ensure -that the best interests of your children come first. The divorce process can be very expensive. At Radley Family Law, it is our aim to mitigate this expense as much as possible. For instance, we offer uncontested divorce services for a flat fee of $499. By helping you and your spouse avoid unnecessary conflict, we can improve your chances of a experiencing a smooth, affordable divorce process. Ending a marriage is a difficult, life-changing experience. It marks the end of what was once a hopeful union. However, with the help of friends, family, and an experienced, compassionate family lawyer, divorcees have a chance at starting a new, happier life. At Radley Family Law, our years of experience have helped us to understand the emotional pain that the divorce process can bring. Whether you are working out where the kids will live or how to divide your possessions, it is our job to represent your best interests in a caring, empathetic way. In Ontario, there are three criteria for divorce: one year’s separation; proven adultery; or acts of physical or mental cruelty by one partner toward the other. To finalize your divorce, an Ontario court will grant you a divorce decree. If you have children, appropriate arrangements need to be made for the children before a judge will grant the parties a divorce; if you do not have children, an agreement is – still recommended. Regardless of your unique situation, divorce is a difficult time, and an experienced, compassionate family lawyer can help you through it. The team at Radley Family Law can guide you through all aspects of the divorce process, and will always treat your interests as our top priority. Issues of child custody are among the most emotionally charged aspects of the divorce process, and a Radley family lawyer can help you make the right decisions for both you and your children. Our team will help negotiate a fair, reasonable child custody, access, and support scenario that places the well-being of your family front and center. Child custody and access agreements determine with whom the child or children will live, and how often the non-custodial parent will have access. Your family lawyer will examine what set-up will best serve the child, and negotiate joint, sole, shared, or split custody arrangements. We understand that this is an extremely sensitive and emotional issue. No parent wants to be separated from their kids. It is our duty to ensure our client’s best interests, and the best interests of their children, are represented. In many cases, couples must undergo a separation prior to being granted a divorce decree. A Radley family lawyer can help you draft a Separation Agreement that meets all – requirements while ensuring your rights are protected. Some couples who are on good terms attempt to complete this process on their own. While this is understandable, especially from a cost perspective, you will run the risk of incurring unnecessary legal fees if the contract is incorrectly produced. By hiring Radley Family Law, you are ensuring that your rights are protected throughout Ontario’s divorce process. Most people voluntarily live up to the expectations of their divorce agreements, such as child support and spousal support. But when a person fails to meet their obligations, the Province of Ontario Family Responsibility Office (FRO) may step in. Rachel Radley, our founding partner, spent nine years working at the FRO, and drafted laws to help FRO ensure individuals obtain the money they are owed by their former spouse. Needless to say, Radley Family Law understands how the FRO works, and how to leverage its influence to ensure our clients are protected. Restraining orders are only required in rare, extreme cases. However, these situations do occur: if your child is under serious emotional or physical threat from a spouse or ex-spouse, or if you feel directly threatened by a former partner, a restraining order may be necessary. In this scenario, your Radley family lawyer will file a restraining order on your behalf. If granted, it can prevent your spouse from contacting yourself or your child in any way. Not all divorces are complicated, combative experiences. In cases where spouses have settled issues relating to their children, spousal support, and their property, they may be eligible for an uncontested divorce. In these situations, the couple will file a joint divorce application or an uncontested divorce. This process is much faster than other forms of contested divorce, and as such is generally much less expensive. A Radley family lawyer will charge just $499 for -our fee for preparing the paperwork for uncontested divorces. A divorce decree granted by a court is the last step in the process of ending your divorce. In Ontario, a couple can divorce if they have been separated for one year, if there is proof of adultery, or if one partner subjected the other to physical or mental cruelty. One of the advantages of a healthy, committed marriage is the financial stability it provides. In some scenarios, this benefit is lost when a divorce is finalized. Your Radley family lawyer will work to ensure that you do not experience undue financial hardship as a result of your divorce, and that your children have access to the resources they need to thrive. Sometimes called a “pre-nup,” it is often disparaged because some people say it coldly takes the romance out of a pending marriage and assumes the couple will end up divorcing. Once you’ve determined who your children will live with and established spousal and child support agreements, your next most important step may be dividing properties and assets. The team at Radley Family Law will represent your interests in this process to ensure that you have access to an equitable share. In Ontario, properties and assets acquired over the course of a marriage are subjected to “equalization” – that is they must be -equalized between the two parties. For couples that have spent a considerable amount of time together, this can be a complicated process. Who will take possession of the family cottage? The matrimonial home? What about the car, or the dog? What will be done with shared finances? In all of these scenarios, an experienced family lawyer can be invaluable. They will make sure that you receive your fair share of the assets accrued over the course of your marriage. Not all separations or divorces need require going to trial, and avoiding the court room is a great way to keep costs down. If you are interested in avoiding trial, a family lawyer can advise you on alternative practices, like mediation and arbitration. 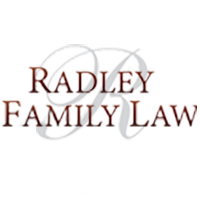 The team at Radley Family Law has helped numerous couples negotiate a mutually agreeable end to their marriage while avoiding litigation. In the mediation process, a neutral third party will help the two parties reach a consensus. With the help of a family lawyer, the mediator can help find common ground on issues like child and spousal support, and child custody. If terms are agreed upon, a separation agreement is drafted and signed. Unlike in the mediation process, arbitration involves both parties agreeing upon a neutral third party, who becomes a decision maker for them both. In other words, the arbitrator will come to decisions that become binding. Under Ontario law, a couple must live “separate and apart” for one year before a court will grant a divorce. There are two narrow exceptions to this rule: If one spouse can prove to a judge’s satisfaction that the other was unfaithful, or if it can be proved that a spouse inflicted physical harm or mental cruelty on their partner or the children, a divorce may be granted in less than one year. We know that a divorce can be expensive. We have lawyers who charge different rates so we always strive to keep your cost low. Also, there are alternatives to court such as a mediated or arbitrated divorce, which cost less. If the divorce is contested, your cost will vary depending on how long it takes to reach an agreement with your spouse and whether we end up in court. How much access to my children must I give my spouse? An overriding concern of the court is that the “best interests of the children” are taken into account during a divorce, and that it is generally important for the children to spend time with each of their parents. In practical terms, this means that children are entitled to have as much contact as possible with each parent, provided doing so is in the child’s best interest. How do I get sole custody of my children? A court starts by assuming there will be joint custody and deviates from this position in limited circumstance. When this happens, usually it is because the Courts feel it is in the best interest of the children for one parent to have sole custody. How do I determine my separation date? There are several ways. One is a sworn affidavit in which you affirm under oath the date on which you and your spouse began living separate lives – even if both spouses remain in the matrimonial home. Evidence of a separation date can be the opening your own bank account, obtaining your own credit cards or filing income taxes separated. If you moved out of the matrimonial home, the date of a lease on a new residence can help establish the date as well.